Midfielder Dale Stephens says confidence is high as Albion head into Saturday’s huge Premier League clash with Swansea at the Amex. The Seagulls are unbeaten in five matches in all competitions but come up against a resurgent Swans who have won four and lost just once in seven Premier League matches since Carlos Carvalhal took over. Brighton are 14th in the top flight, just one point ahead of 16th-placed Swansea with 11 league matches remaining. Stephens is targeting a strong finish to the season, especially now the club has extra firepower after the January arrivals of Jurgen Locadia and Leonardo Ulloa. Albion have six of their remaining 11 games at home - and four of the next five - and Stephens feels results at the Amex will play a large part in where they finish the season: “Home form will be key. “We knew from the start of the season it would be. 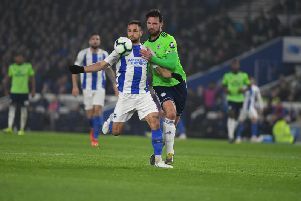 Stephens is one of just 14 players - and one of only seven outfield players - to have played every minute of every Premier League game this season and he has been involved in 30 of Albion’s 32 matches this season, missing only the EFL Cup ties. He said: “I’ve played two 45 minutes (in the FA Cup) but I’ve said before I want to play in every minute of every game where it’s possible. Stephens feels Albion’s FA Cup progress has bred confidence throughout the squad this season, after wins over Crystal Palace, Middlesbrough and Coventry, but said: “It’s great to have a good cup run but we know it isn’t our main priority this season. However, it gets boys minutes and good performances get opportunities.